6 Bedroom Detached House To Rent in London for £6,000 per Calendar Month. 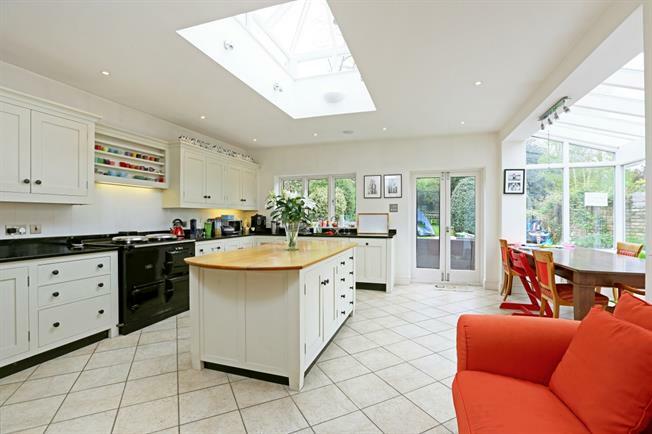 This fabulous detached house offers flexible contemporary accommodation for entertaining and family living and has been refurbished to a high standard. On the ground floor the bright and spacious entrance hall opens onto two large reception rooms, one with direct access to the garden and there is a lovely flow through to the beautiful kitchen/dining room with underfloor heating, which also opens onto the garden. There is also a good size utility room and a guest WC. The ground floor has wood flooring throughout. On the first floor, there is a well-proportioned master bedroom and en suite bathroom with a free-standing roll top bath, two further double bedrooms and a family bathroom. There is a separate annexe, having a further bedroom and modern bathroom, double height ceiling and staircase to the ground floor, ideal for a nanny or housekeeper. On the top floor there are two further double bedrooms, one of which offers views over the All England Lawn Tennis Club and an additional contemporary family bathroom. Somerset Road is a sought after residential location opposite the All England Lawn Tennis Club and Wimbledon Park and close to the exclusive bars, boutiques and restaurants of Wimbledon Village. The National Rail and District Line station in Wimbledon Town Centre are also easily accessible.